A princess to the Gorinthan country,Lenneth is a tomboyish woman who rebels against her father, in attempts to further distance herself from the thrown and royalty. Her hopes of saving the lower class of Nosa-Sage, the Capital of the country, are often stopped by her father, the politics of the nation, and pointless wars she manages to be dragged into. Lenneth has a tomboyish attitude. When it comes to leading and planning, she has a very stoic and powerful mindset, much like her father. Strong and heart and iron willed, Len is often found spear heading direct charges and being the mastermind behind planned assaults and additional tactics the country uses during the warring eras. Likes-Pink, Felines, White, Bracelets, Swordplay, Meditation, Smithing, Alchemy, Psionics, Leather, Love, Reading and Collecting Weapons. Dislikes-Royalty, Money, Nagging, Mechanical objects, Torn Materials, Being Bored, Having to Cook. Lenneth was born several years after the founding of the Gorinthan empire. Raised to be a ruler, the young girl traded off dolls and civility, for swordsmanship and diplomacy. Her father's teachings would raise Lenneth to be the strict, precise soldier that she eventually grows up to become. Father-Lord Gorintha- Current Ruler of the Gorinthan Empire, Biological father. Mother-Unknown-Lenneth's mother is never mentioned by her father, and is presumed dead at this time. Adopted Sister-Kai Lin- Kai Lin was adopted early into Lenneth's Teens, and is currently Len's only sibling. Eletania is a World on a very brittle treaty from war. Gorintha is a Country built upon a narrow, peninsula like region of land. Surrounded from the west by 2 nations, and south across a major river by another, the country is practically landlocked, forced to keep itself in various national treaties to keep it's surrounding, considerably more advanced countries from attempting to take them out solely for the extra land, and lowered threat. Lenneth, in all her forms, always appears with Pink hair, more often than not in a bob cut fashion. While not overly curvy, Len is far from lithe. Markings under the girls gauntlets, etched into the backs of her hands, are the sacred divinity marks that often appear in her families lineage, predominantly appearing on the females of the family line. Her armor is a hybrid attire,compromised of Leathers and metal to help support her sudden agile moves on the battlefield. always avoiding formal wear, skirts are the closest thing the girl ever gets towards anything that might be considered "upper class attire", and is often found wandering around the streets in a simple tank top and skirt whenever she's not suited up in her armor. When in her armor, Lenneth tends to wear a small circlet her father had crafted for her prior to the war breakouts, which provides minor amplification to her divine abilities. a Bracelet under her gauntlets is always worn, etched with "Soren" on it's inner lining, a matching jewelry piece given to her by Soren, who was also the recipient of Lenneth's Custom Ring. Please excuse the size of this PNG file.i like to draw in large sizes on occasion. This is another Reference sheet for one of my story world characters,Lenneth Aeronhart. Lenneth, Lennie, or Len for short. Born into Royalty, Lenneth lives the typical,overly luxurious lifestyle that a princess is often raised upon.However, she is not a fan of such a rich lifestyle. The people of her country,Gorintha, suffer in apparent poverty as her father protects her and the upper class, by separating the Capital city, Nosa-Sage, into upper and lower districts. The city is split by a great river, helping to carve, and further push the two sides of the city further apart. Rather uppity,Nationalist and Righteous at heart, Lenneth cannot stand for such a life. The moment she is given the opportunity, she enlists into the cities royal knights, despite her father's loud rants and relentless refusals to back her decisions. As such, the tomboy attempts to hide herself amongst the other cadets. While many of the new recruits know the girl by name and appearance, Lenneth changes her last name from Gorintha, to Aeronhart, in an attempt to further distance herself from the throne, and the silent, withdrawn lifestyle such a title entwines with it. Lenneth is a main story character. She helps to drive the story, as well as having a major role in the events during the Gorinthan civil war, and the great demon hunts that alter her country forever. Her family is of Holy descent, and as such she is born innately attuned to Holy abilities and skills. Her family trait, a "Divine Touch" allows her to burn demonic beings, and heal humans, by making contact between her hands and their bodies. All skills Lenneth possesses have either a Holy attribute to them, or a healing property, aside from a shield throw and weapon bash. 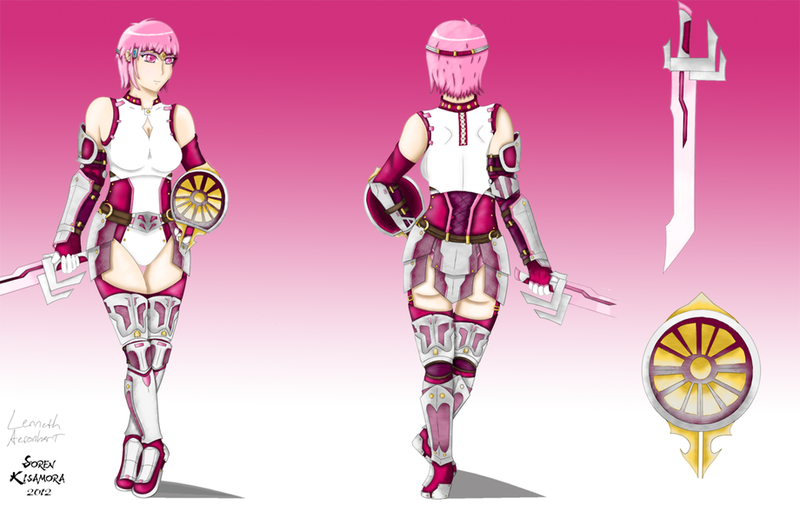 Her sword, "Tryst" [Meaning a secret meeting between lovers] is custom forged for her by Soren Kisamora, and is properly forged and blessed with divine techniques to give the blade it's pink tint, and Holy aura. Demons attempting to wield her blade take constant, seering damage to any part of their being that makes contact with the weapon, it's blade leaving "Divine scars" on those it cuts, wounds that never properly heal if inflicted unto demons or beings associated with demons. It took me a while to finish drawing this.I thought for a good while about what i wanted Lenneth to wear.again oddly like Soren, she is a primary story character that until this drawing, had no model or design physically created. Drawing inspiration from armors of games i love to play, and adding my own ideas to them, the primary defense of the set is Leather on the upper torso [where the majority of her movements would be occurring] and a Lighter form of Steel for any metal portions of the set. If it wasn't obvious, Pink and White are the colors I will always associate with Lenneth. Any form of her i ever draw will always have pink hair, and be wearing something on her that is white in some form. I was also attempting to use a few new brushes i got my hands on.one of them meant to give detail and texture to metal objects. While i think it did it's job, in some places where i tried to wear away at the paint in her armor i feel like it was hit and miss. Regardless, I feel that this is a perfect interpretation of Lenneth. Lenneth is my Original Character, and Relevant to my Eletania story universe. I am considering this to be the Canon version of Lenneth, as such any other version i draw of her will either have a different name [ie-Neko Len] or will have an explanation as to why she looks different. This is also my first piece to have my new signature on it. while it's no longer me personally signing my pieces, i feel that using a font I enjoy, and typing my name into place, is a bit cleaner, and easier to control it's size and shape, as my cursive writing can be rather erratic and all over the place. Overall, this is definitely on the top of my list for my current favorite pieces I've done in the past few months.